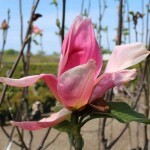 It is a narrow, upright tree, unusual for a Magnolia. It has large, deep pink flowers that open late in the season. Very fragrant, this selection also blooms at an early age. It prefers a rich, medium moisture, well-drained soil and full sun to part shade.